How much can you really analyze the films of The Fast and the Furious franchise at this point? They know what they are, and the fans of these movies definitely know what awaits them with each, new entry. The formula is evident: fast cars, silly dialogue, colorful but badass characters, and family, always family. The eighth and latest entry, The Fate (F8) of the Furious, is no different from the rest, and, though the film provides an endless slew of over-the-top and impressive stunts and a complete disregard for the laws of physics, it never recreates the feeling of excitement this franchise has delivered so many times before. The motor propelling The Fast and the Furious series may not be completely out of steam, but the check engine light has definitely come on. It's amazing how well this action series has been able to redefine itself over the previous, seven films in the first place. What once began as a pseudo-Point Break knockoff with street racing replacing surfing bounced through a number of weird entries before morphing into an extreme sport version of Ocean's 11. F8 continues the latter trajectory with the team of high-octane thieves and all-around badasses led by Dominic Toretto, once again played by Vin Diesel, as well as Dwayne "Franchise Viagra" Johnson returning again as Luke Hobbs, the DSS agent who has befriended the crew. This time around, however, the team will be going up against their greatest challenge yet: Toretto, himself. 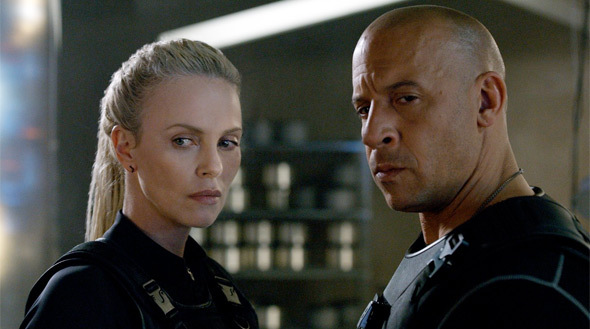 Manipulated by Cipher, a brilliant cyberterrorist played by Charlize Theron, Toretto turns his back on his team of friends and loved ones as well as the US government agency he's become an ally to. Now, it's up to the crew to go after Cipher and sort out why their former leader turned against them. You can rest assured knowing that all manner of vehicular anarchy is about to go down. What the makers of F8 realize all too well is just how little story needs to be included in these films. You put the ragtag crew in various, high-performance vehicles, create an absurd set-piece in a famous city, and let the chaos reign as its will. It's a formula that has worked wonders for the franchise thus far, and it provides F8 with the only, real reason to see the movie. The stunts and action in this film, under the direction of Straight Outta Compton helmer F. Gary Gray, are suitably nuts. They never fail to keep our interest firmly in grasp even when the story driving it all is less than stellar. This creates something of a vacuum of excitement in the spaces between, the scenes that are filled with more dialogue than explosions. Yes, there is plenty of humor to be bandied between Tyrese Gibson's Roman and Chris Bridges' Tej and a barrage of tough guy talk, especially between Johnson's Hobbs and the newest member of the team, Jason Statham's Deckard Shaw dropping his villainous role from the last outing down a few notches to help the team take on Toretto. Much of what remains in F8's story development is left to exposition about either the chaos we've just seen or the chaos we're about to see. Not much of this is exciting, but, at the very least, we're never confused on the plot points. The less said about the way Diesel handles his morally questionable turn this time around the better, but the man can still monologue about family with the best of them. His is really the least interesting character of the bunch in F8. Michelle Rodriguez offers a modicum of drama with her portrayal this time as Letty, Dom's wife, but the feeling can't be helped that her part should have been bigger in this film. Theron, on the other hand, has even less to do in her cyberterrorist, protagonist role, most of her scenes either hinging on dialogue exchanges with Diesel or her character staring intently at a computer monitor. The Fury Road star doesn't even get to drive a vehicle of her own, which seems like an obvious waste. What isn't wasted, though, is the opportunity to deliver bigger and more explosive action than ever before, and F8 absolutely delivers on that promise. In all reality, this seems to be the only aspect driving The Fast and the Furious saga at this point. F8 doesn't attempt to be more than it should be, and there's an admiration that has to be felt for how little is given to anything but the action. No doubt there will be more and more action to be had in future outings for The Fast and the Furious, but it may be high time the franchise redefines itself once again. Whether that happens or not, F8 proves that this series still has ideas aplenty when it comes to insane vehicular action.